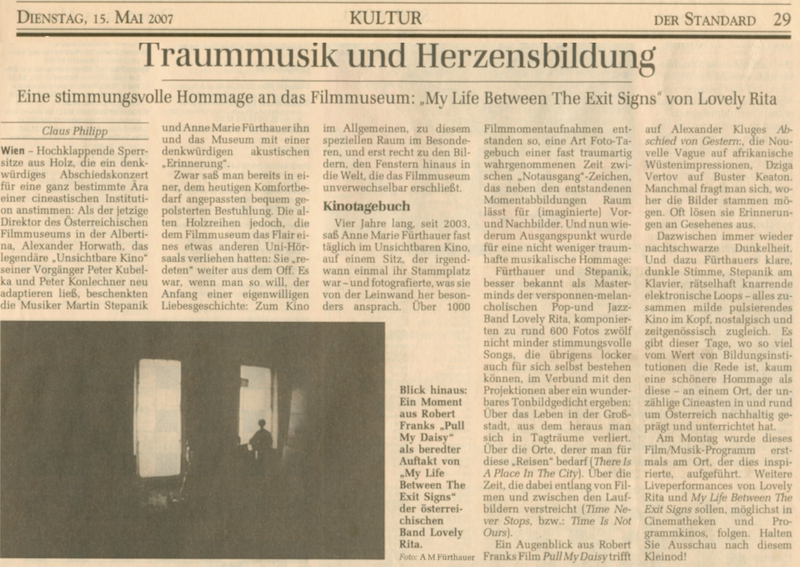 The premiere of “My Life Between The exit Signs” (7.10.2006 at the “Film Galerie” in Krems) and above all the vienna-premiere (14.5.2007 at the “Filmmuseum”) were taken up by the public, as by the press with enthusiasm. This work is an homage to the cinema, not only to the film museum in Vienna, where it has been developed, but to all film-archives and arthouse-cinemas of this world, that become fair to the same idea and the same requirement. The surprise came in several waves. I had known Anne Marie Fuerthauer and Martin Stepanik since 2003 when they created a work of sound art in memory of the soon-to-be removed (and famously clattering) wooden seats at the Austrian Film Museum. We presented this piece of musique concrète to the first users of the redesigned auditorium in October 2003, now all seated on softer and much less audible chairs. Four years later, Anne Marie returned with a different kind of homage – a tribute not only to the museum but to film and movie-going as such. During her many years as a visitor of our programs, always in a corner seat in the last row, she had silently and secretly made more than a thousand photographic stills of the auditorium and the distant screen, catching along the way a rich array of “cinematic glimpses”, frozen splashes from the current that we call film history. Adding to my surprise, she told me that together with Martin and their band Lovely Rita she was working on a series of 12 songs which would be cued by these stills and by Anne Marie’s experiences as a cinephile. The songs turned out to be fabulous both individually and as a piece of program music – 12 intricately connected instances of one art practice being born from another, with a third art form, photography, as the go-between. When we invited Lovely Rita to premiere their work live at the Film Museum, it was enthusiastically agreed that the original stills should also be “invited back” to fill the screen above the musicians. The resulting opus was named My Life Between the Exit Signs, and while it doesn’t include film as such, Lovely Rita’s mesmerizing music in dialogue with Anne Marie’s ephemeral photographic “memories” of screenings was instantly understood and praised as a “live work for the cinema”. One critic called it a “softly pulsating cinema of the mind”, echoing the feeling among the Vienna audience that, for non-filmmaking artists, it is only a question of imagination and a few well-chosen steps of artistic transfer to fully evoke the magnificence of movie civilization. Vienna – Rows of wooden fold-down seats which set the stage for a memorable farewell concert marking the end of a very special era of a film institution. 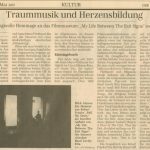 When Alexander Horvath, current director of the Austrian Film Museum at the Albertina had the legendary “invisible Cinema” of his predecessors Peter Kubelka and Peter Konlechner readapted, the musicians Martin Stepanik and Anne Marie Fürthauer regaled him with a memorable acoustic “souvenir”. Now the audience already sat in nicely cushioned seats adapted to meet today’s standards of comfort. However, the old rows of wooden seats that had given the Film Museum the flair of a university auditorium still “spoke” from the off. It was, one could say, the beginning of a strange love story. A love for cinema in general, and to this auditorium in particular, and even more for the images, the windows to the world that the Film Museum opens up in its striking way. Four years long, since 2003, Anne Marie Fürthauer sat in this invisible cinema almost daily, on a seat that at some point had become her seat – and photographed what specially appealed to her on the screen. The result was more than a 1000 film stills, a sort of photograph-diary of an almost dream-like perception of time between the “exit” signs which in addition to the stills she created provided space for (imagined) pre- and after-images. And now this became the point of departure for a musical homage that was no less oneiric. Fürthauer and Stepanik, better know as the masterminds of the visionary -melancholy pop and jazz band Lovely Rite composed twelve no less elusive songs to accompany 600 photographs – songs that could just as easily also stand for themselves. Together with the images projected onto the wall they resulted in a wonderful sound-image poem on life in the big city, out of which one becomes lost in daydreams. About the places one needs for this “journeys” (There Is A Place In The City). About the time that elapses along films and between moving images (Time Never Stops or Time Is Not Ours). One moment taken from Robert Frank’s Film Pull My Daisy catches Alexander Kluge’s Abschied von Gestern; Nouvelle Vague fits desert impressions, Dziga Vertov Buster Keaton. Sometimes one wonders where the images come from. Often they evoke memories of past events. The pitch-black darkness that keeps recurring in between. And this accompanied by Fürthauer’s clear, dark voice, Stepanik at the piano, enigmatically creaking electronic loops – all of this resulting in a mildly pulsing cinema in the mind, both nostalgic and contemporary. In this time when there is so much talk about educational institutions there is a hardly a nicer homage than this – at a place that has trained left its stamp on countless cineasts in and around Austria.On Monday this film/music program was presented for the first time at the place that inspired it. Further live performances of Lovely Rita and My Life Between Exit Signs will follow at cinematheques and special cinemas. Keep an eye out for this gem of a performance! Utopian places, unknown cities and desert landscapes, faces, bodies, shadows, vague gestures of resignation and hope: Pictures in the black area. 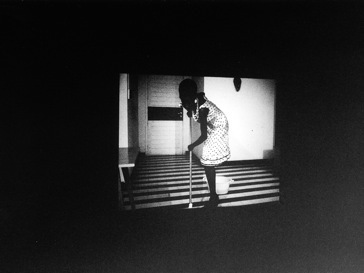 Fragments of lost stories become evident in the straggled movie stills, which Anne Marie Fuerthauer manufactured between 2003 and 2007 in the invisible cinema of the “Filmmuseum”. From always the same seat she collected with her camera about thousand snapshots of the current films and produced a kind photo diary: About 600 “auratic” movie stills from this collection have been assigned under the project title “My Life Between the exit Signs” to twelve five minutes lasting music pieces, which she composed with Martin Stepanik for their ensemble “Lovely Rita”. In the dreamy music, the jazz-phrased, electronic chansons, the emotional playgrounds of the “old art” of moving pictures is untied and the splendid solitude of the cineaste is celebrated. The black phases between the photos increase, like the darkness beyond the picture-edges, the association-longing, and let own, internal films develop: a cinema “out of time”. In September 2003 Stepanik and Fuerthauer had produced a short experimental composition, an “audio film” from the “Knarren” of the tilting armchair in the hall before its renovation. Also this new work, that “Lovely Rita” is performing live as a “quintett”, became a subtle, now evening-filling homage to the film museum: to a place in the city, at which one can lose oneself in stories of others, strangers, in “auratic” pictures and sounds, for a while .